Avalon V5 Preamp DI RE-Mic Preamplifier. The Avalon V5 introduces a fifth generation DI-RE-MIC PREAMPLIFIER loaded with professional features, including; a low noise, high-gain, Pure Class A, microphone preamplifier with dual impedance ideal for ribbon-dynamic and high level condenser microphones. What features does it have? The V5 features include a minimum audio signal path, high quality transformer input & isolated output. Microphone and Hi-Z inputs up to +36dB. DC coupled Pure Class A output, a large illuminated professional VU meter, and twin LED peak signal indicators. Regulated +48v phantom power supply. Variable passive high pass (bass cut) filter. All signal routing with sealed silver relays. This mint condition product includes the original box, manual, and all original accessories. These charges are the buyers responsibility. 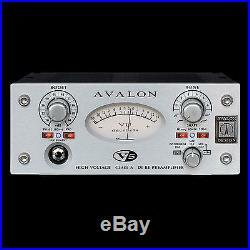 The item "Avalon V5 Preamp DI RE-Mic Preamplifier" is in sale since Monday, June 01, 2015. This item is in the category "Musical Instruments & Gear\Pro Audio Equipment\Preamps & Channel Strips". The seller is "altomusicpro" and is located in Middletown, New York. This item can be shipped to United States, Canada, United Kingdom, Denmark, Romania, Slovakia, Bulgaria, Czech republic, Finland, Hungary, Latvia, Lithuania, Malta, Estonia, Australia, Greece, Portugal, Cyprus, Slovenia, Japan, China, Sweden, South Korea, Indonesia, Taiwan, Thailand, Belgium, France, Hong Kong, Ireland, Netherlands, Poland, Spain, Italy, Germany, Austria, Russian federation, Israel, Mexico, New Zealand, Singapore, Switzerland, Norway, Saudi arabia, Ukraine, United arab emirates, Qatar, Kuwait, Bahrain, Croatia, Malaysia.